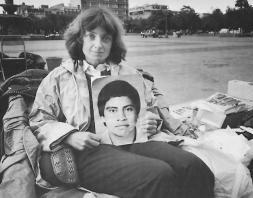 When information surfaced that the US government had information on the fate of Bámaca, and the perpetrators responsible for his detention, torture, and eventual murder, Jennifer took her hunger strike to the streets of DC. She began to fight civil rights cases against the CIA, the State Department, and the National Security Council. In 1995 Congress finally released documents proving that the United States, which previously denied knowledge of his disappearance, knew that he had been captured alive by the Guatemalan military. Her case caused a scandal at the highest levels of government, as it was revealed that Bámaca’s torturers were paid CIA assets. As a result, then-President Clinton ordered declassification of secret archives on the Bámaca murder and other human rights crimes committed by the Guatemalan military. The Guatemala Declassification Campaign led to the disclosure of thousands of records on US support and collaboration with Guatemalan government atrocities. The records are now being used as evidence in dozens of Guatemalan human rights cases. Jennifer’s case demonstrates that the right to truth is an essential element to the right to justice. With no just resolution to the case in Guatemala, Jennifer took it to the Inter-American Court on Human Rights (IACHR) in Costa Rica. In December 2000, the IACHR found the Guatemalan military guilty of the disappearance, torture, and execution of Efrain Bámaca Velazquez and in 2006 the Guatemalan government apologized for his murder. The Guatemalan government still took no action, and it wasn’t until 2009, when the IACHR ruled that Guatemala had not complied with the sentences, that the criminal process resumed in earnest in Guatemala. A series of remarkable recent rulings by the Guatemalan Supreme Court has permitted the Bámaca case and others to move forward in the penal system once again. The rulings required Guatemalan courts to comply with international law, including the Inter-American legal principles and decisions. The case sets a crucial legal precedent prohibiting the forced disappearance and torture of any human being, no matter what their political, religious or racial backgrounds, and no matter which side of the internal conflict they supported. There is no exception to the ban on torture, and hence no justification, legal or moral, for the 200,000 dead and disappeared in Guatemala.